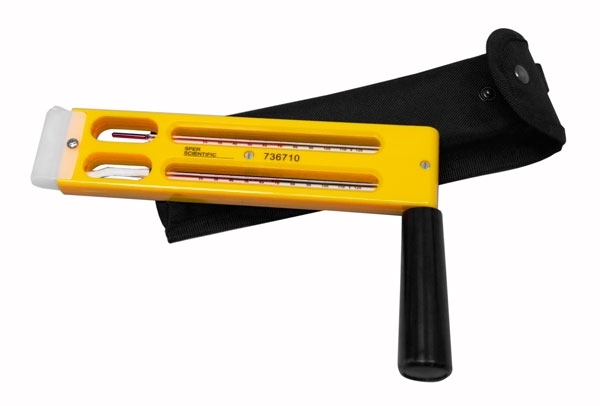 Sling Psychrometer | Whirling Hygrometer - Gilson Co.
MA-164 Sling Psychrometer, also known as a whirling hygrometer, determines relative humidity in a range of 1% to 97% RH. The hand-held, easy-to-use hard plastic unit protects two encased red-spirit filled thermometers with temperature ranges of -5—50°C (20—120°F). It allows for fast and accurate humidity readings; readings are compared from the wet and dry bulb thermometers to those indicated on the included humidity chart to determine relative humidity. The psychrometer is equipped with a water reservoir, eliminating the need for continually re-wetting the wick. Product dimensions are 9x2x0.63in (227x51x16 mm). MA-164 is also supplied with a carrying case and strap. The meter’s handle folds for easy storage in the carrying case.